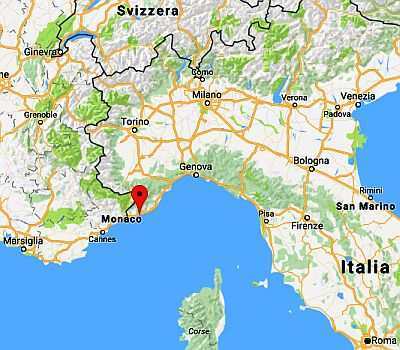 The climate of Sanrermo, a city in western Liguria, is Mediterranean, with mild and relatively rainy winters and warm and sunny summers. The city is located on the Western Ligurian Coast ("Riviera di Ponente"), an area having a particularly mild climate: the average temperature of January, as high as 10 °C (50 °F), is found again only in Southern Italy, while in summer, hot days are rare. It is no surprise that the city is famous for the cultivation of flowers, in addition there are many palm trees and subtropical species. On the other hand, the wind blows quite frequently. In the neighboring towns such as Ventimiglia, Bordighera, Arma di Taggia, Imperia, Diano Marina, Alassio and Albenga, the climate is similar. The rains in the Riviera di Ponente amount to about 700 millimeters (27.5 inches) per year, and follow the Mediterranean pattern, in fact they are more abundant in autumn and winter, and have a minimum in summer, when it rains very rarely. Here is the average rainfall in the nearby city of Imperia. Winter, from December to February, is mild; in particular, sunny days are pleasant: the temperature can reach or exceed 15 °C (59 °F) when the sun shines, while the Po valley is shrouded in mist and maybe in frost. In periods of bad weather, it can be a bit cold, but snow is very rare: for example it snowed in February 1986 and in February 2010. Frosts are also very rare and almost always light: usually the temperature does not drop below -2/-3 °C (27/28 °F) even during the most intense cold waves, and it may very well remain above freezing (0 °C or 32 °F) for a whole winter. Spring, from March to May, is mild and increasingly sunnier, although there are also some rainy days. Summer, from June to August, is warm and sunny. Generally, the heat is not excessive, thanks to the influence of the sea and the sea breeze: it is rare for the temperature to even reach 32/33 °C (90/91 °F), however, some sultry periods or some very hot days can not be excluded. Some weather fronts may pass over the city even in summer, especially in June and in late August, or on sunny days some heat thunderstorms can reach the coast from the interior, but normally the sun shines. Autumn, from September to November, is mild and humid, with sunny days, but also periods of bad weather. The amount of sunshine in Sanremo is very good in summer, when clear skies prevail, while in the rest of the yar, sunny periods, which can occur in this season as well, alternate with cloudy periods. 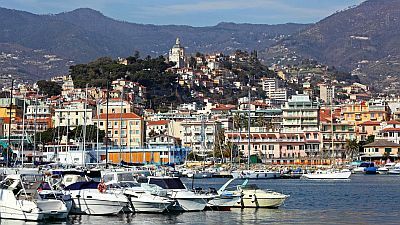 In the nearby city of Imperia, there are 2,570 hours of sunshine annually, ranging from 4.5 hours of sunshine per day in January to 10.5 in July. Along the coast of Sanremo, the sea is warm enough for swimming in July and especially in August, when it reaches 24 °C (75 °F), while in June the Ligurian Sea is still cool. The best times to visit Sanremo are spring and early summer, in particular from mid-April to mid-June. September, too, is a good month, especially in the first half, while later, Atlantic depressions become more frequent. In the height of summer, in July and August it can be hot, although less frequently than in other parts of Italy. For a beach holiday on the Western Ligurian Riviera, the best months are exactly July and August.